Please double check your entries. If any domains are adult in nature, please go back and make sure they are identified by adding ',adult'. After you submit your domains here, you'll be immediately prompted for the next step, which is ownership verification. If you have domain names that you would like to submit into our domain auctions, please click the icon to start the submission wizard. Domains that make it to auction are voted on by the Bido Community. You may skip the voting process and accelerate your domains to auction by using BidoCredits. In the rare event that you may have any trouble with your submissions, please fill a support ticket and we will list your domains manually for you. Also, we will do verifications for you if they get stuck, you do not need to write us about this. We are currently upgrading some of the systems and appreciate your understanding. Bido accepts all ccTLDs (.de, .co.uk, .in, etc. ), gTLDs (.com, .net, .org, .info, .biz), and some sTLDs (.mobi, .name, .pro, .asia) for auction. Adult domains are allowed, however we ask that you categorize your adult domains in the adult category properly. As a general guideline, it's best to submit only one or two word generic domain names. Exceptions would be a two letter/character .com, or a three digit.com. Some restrictions on the free submission for auction apply. You specify your BidoPrice anywhere from $9 on up. The community votes on what goes to auction, based on the item and it's BidoPrice. Bido recommends pricing your domains with an accurate BidoPrice. Since domains are voted on if they go to auction, it's your responsibility to price your domains accurately so that they get voted on, subsequently make it to auction, and attract bidders. The more bidders, the more pressure, and the better chance for bidding wars. 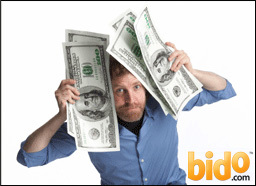 Bido allows the sale of domains at any price level above our minimum starting BidoPrice of $9. The BidoPrice system allows you to ensure that your domain is guaranteed to not sell at a drastically low price. In addition, if the auction closes and your BidoPrice isn't met, Bido automatically gives you the option to log in and click to accept the highest bid within 24 hours of the auction close. BidoPrice gives buyers full control because while your domain is up for voting, any prospective bidder may place a prebid and instantly send the domain to auction. Next to the Vote icon is a Bid icon, and a preliminary bid is essentially considered as enough votes to go to auction. The Bido commission is a percentage of the sale amount for all sales (applicable only to successful sales), there are no minimal fees. It's free to submit domains for voting to go to auction. Should you wish to skip voting, after you submit your domains, you may accelerate your listings to auction by using BidoCredits. The fee structure to accelerate your listing to auction (should you not want to wait for votes) is 0.01 BidoCredits per each $10 of your selected BidoPrice). If your auction ends with a winner, the BidoCredits are returned back to your account for reuse later. If the auction closes with bids and your BidoPrice isn't met, Bido gives you the option to log in and click to accept the highest bid within 24 hours of the auction close. Bidders are bound to honor their highest bid for 24 hours of the closing time of the auction, even if the BidoPrice is not met. This gives you a fallback option to sell your domain even if the price level did not meet your initial expectations. In addition, if you select the highest bid within 24 hours, any acceleration BidoCredits you may have used are returned back to you. Carefully read the emails that Bido will send you. We send instructions (and reminders if necessary) about any actions you need to take with your listings. At each step of the way, we'll send you emails with important information to walk you through the process and show you what to do next. Our platform is designed to make it quite simple to buy and sell, once you get started you will see just how easy it is. And we're here to help. After you submit your domains, you'll be instructed via email about how to verify ownership of your domains. Once verified, the Bido community votes on what goes to auction. When your domain receives enough votes, you'll be contacted to setup your auction (or it will be setup automatically for you if it gets a bid, as well as if you have autolist enabled and it gets enough votes). If you do not want to wait for votes, you may wish to consider auction acceleration. Click the icon below to start the submission wizard. First time on Bido? Click here to register for a full account. Bido's listing format ensures that items that are in demand will go to auction. If you have inventory to divest and attract the maximum liquid value for your domains, Bido is here to help. We encourage you to view our complete Auction Archive.